Gili Island is a popular destination in Indonesia. 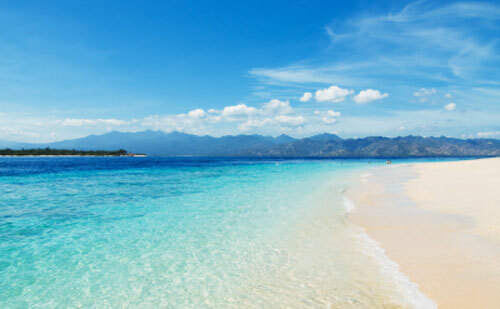 Gili Islands located in the north west of Lombok, featuring three small, coral fringed islands; Gili Air, Gili Meno & Gili Trawangan, each with superb, white sandy beaches, clear water, coral reefs, brilliantly colored fish and the best snorkeling on Lombok. Visitors, especially young European is attracted to the simple pleasures of sun, snorkeling, beautiful beaches, and socializing. The absence of cars, motorcycles, and hawkers adds greatly to the leasure of staying on the Gilis. “Gili islands” is not the local name. Gili actually means Small Island and there are lots of other gili’s around Lombok. There are many options for an enjoyable holiday on the islands. We can rent snorkeling equipment, join a diving course, rent a kayak, go fishing, or take a glass bottom boat to see the magnificent coral reefs and fishes. There are lots of quality scuba diving operations on all the islands. The coral around the islands is good for snorkeling, which can be reach from the shore. See rays and giant clams. A must see: Turtles Point, Meno Wall. Dive Schools available on all the islands with many dive programs to choose, from beginners to advanced technical dives. While divers are able to regularly swim with black tip, those who prefer to just drifts in the currents with a snorkel, fins and mask are never left disappointed by the more than 6,000 species of marine life living just off-shore. Fishing is one of the highlight activities on the islands. Deep fishing remains the best on north west of Gili Trawangan.